*Package deal is for two people. $200 deposit required. 7 days cancellation policy with $50 cancellation fee. Less than 7 days – no refund. No further discounts apply. 3,4 &5 NIGHTS MID-WEEK PACKAGE DEALS ! Package deals are for two people in rooms with two double beds, microwave and fridge. Package deals are fully pre-paid and non-refundable. No further discounts apply. From open NOW TILL JUNE 8TH!!! From September 15 till close! Packages & specials are limited to rooms only upon availability. All packages & specials are based on two full size beds and double occupancy; extra person fee will be applied. A 12% tax will be applied to all packages & specials. Coral Sands regular cancellation fee does not apply to packages & specials. 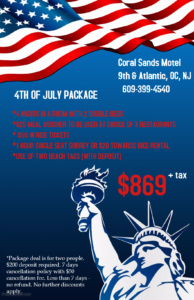 Call Coral Sands Motel in O.C.N.J.